When I woke up today I realised that I'm visiting my friends house & I don't have anything to take! I usually always make my cakes from scratch but when time is pressing, you just need to take shortcuts, and when I need to take cupcake shortcuts, there is only brand I trust to give a great home-made result! Betty Crocker! - Im sure you have Heard of them, and you have probably used their products too! Needless to say, I was so pleased when i visited my local supermarket recently and saw that Betty Crocker had made a face change to all their packing - making it even better!! My Mum has always said that I am a 'marketers dream' as I love anything with pretty packaging, and I have to admit, in this instance, she is not wrong! 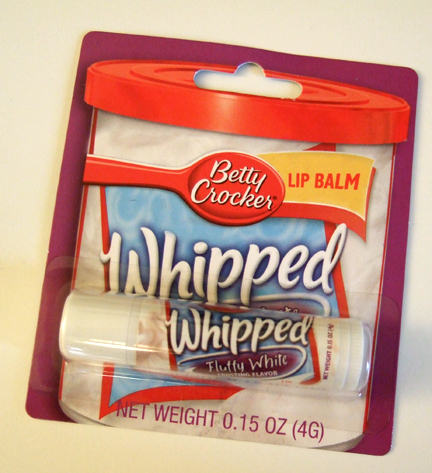 All of the betty crocker products seem to have taken on a 'Vintage Kitchen' feel, which I fell in love with! The logo remains recognisable (of course! ), but the boxes are all made up of these wonderfully pastel colours, and polka dot themed edging - how cute! I really like how the product images are all placed on a cartoon like cake pedestal, and the fact that all the boxes have a cartoon image of Betty is so adorable! But, you know what they say - you should never judge a book by its cover! Just because the Box is pretty, doesnt mean whats inside will necessarily be the same! I Hoped that just because the packaging had changed, that the actual product had not changed - they were perfect as they were! After all, Bettys Promise states 'With Betty you can bake perfect cupcakes every time'. I Made the 'Caramel CupCakes', and they did not dissapoint! All i had to do was add eggs, oil, water & butter to make 9 of them! so simple! The kit had some lovely caramel icing and chocolate drop style decorations, which really finished them off perfectly! I cant wait to taste them! If they taste as good as they look then I dont think there will be any left this afternoon! 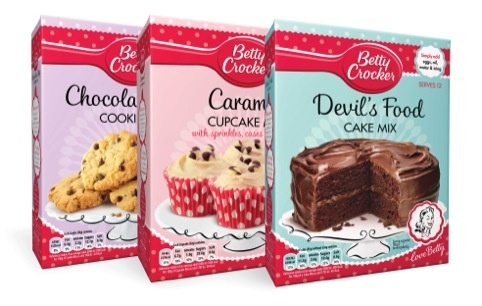 The New range doesnt stop at cake and cookie kits, 'Betty' has also saved stressed out baker more time by offering a range of tubbed icings & frostings! Granted, the UK Range isn't quite as wide as the US version, but thats not to say that it doesnt offer anything you would need as a 'quick-fix' solution! I Have previously Tried the Vanilla & the chocolate fudge buttercream style icings and they are nothing short of amazing! the tubs come in the same wonderful packaging and stay fresh for, well forever! once you pop open the lid, you will not be able to keep yourself from dipping your finger in and having a cheeky taste! The icings spread wonderfully and have the perfect consistency so that you can pipe them if you want to! The taste is amazing, a real homemade style feel that (if you havent told them already!) no one would second guess if you try to pass it off as your own! I have to say, though that I am so jealous (once again!) 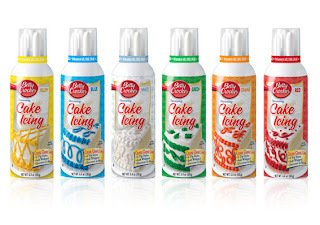 of the Americans - they have such a wide range of the Betty Crocker products that I would love to taste and try! 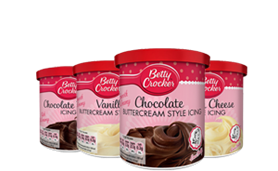 Their Icings and frostings range is beyond belief, (Head over to 'Betty Crockers' US website to take a look for yourself!) 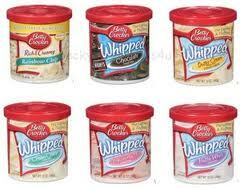 with endless flavours of frostings & whipped toppings,, I just wouldnt be able to decide! 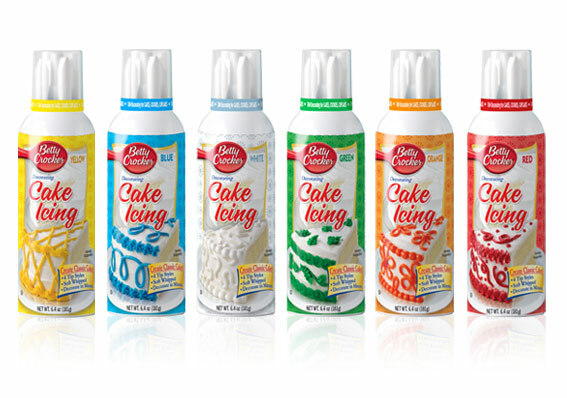 They even make wonderful 'cake icing' tubes which would make precision decorating a breeze! Each Tube comes with a number of nozzles to choose from so you can create an design in any colour! I believe I have seen some variety of this in the UK, but I have not tried it (yet!). 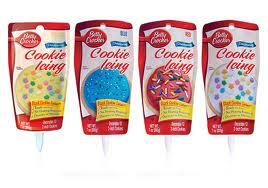 There is even a range of 'cookie' icing pouches - how amazing! If there is something us Brits don't do big enough - its cookies, & this cute range would certainly help with that! Each Pouch has a precision nozzle so that cookies can be decorated with pretty patterns and colours galore! I have seen a variety of branded lip balms in some UK stores, such as fizzy drinks, starburst, skittles and a few more, but I would just love to try this, if its as good as the frosting itself, I would be a life-long fan! Visit the Company Website here to View the products for yourself & for some fantastic recipe ideas!